This trio of travel-sized sauces packs a fiery punch on the go. If you always keep hot sauce in your bag (or always wanted to), this trio of travel-sized sauces packs a fiery punch on the go. 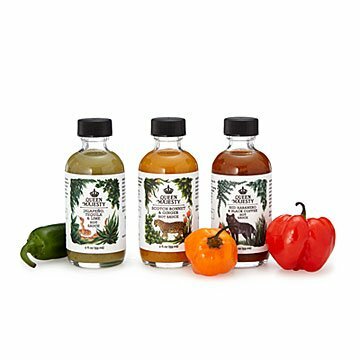 Crafted in small batches, each two-ounce bottle offers uniquely enticing flavor medleys—jalapeno, tequila, and lime (medium), scotch bonnet and ginger (hot), and red habanero with black coffee (hot). All natural, preservative-free, sugar-free, and vegan, they're portable heat for wherever your culinary adventures may take you. Handmade by Erica Diehl in Red Hook, Brooklyn. Brooklyn-based Erica Diehl is an apt ambassador for the borough. She's a graphic designer, DJ, and full-time hot sauce creator. Since the early 2000s, she's been producing small-batch sauces from her kitchen in artist-and-maker-friendly Red Hook to provide people with delicious, healthy hot sauce that adds exciting flavor as well as heat. I bought these today at the Greenpoint Loft Holiday Market. I tasted all 3 there - they were completely different from each other, all with a great flavor. Not very spicy, but very flavorful. Definitely recommended! All 3 sauces were amazing and I will be buying a bigger bottle of all 3 once these little guys run out? Witch will not be long.